The Mochi caste is considered by some to be a branch of the Chamar caste, but the Mochi have repudiated that, considering themselves to be a separate caste of higher status than the Chamar. "The Chamar do the initial dressing of hides, while the Mochi make leather products from the hides." In the past, some of the Mochi were involved with removing carrion and selling the bones and hides. They accept water and food from all communities except the Mehtar and Ghasia, which they consider to be below themselves socially. The Mochi are subdivided into subgroups and clans, and there is a social ranking system between the subgroups. Their important marriage ritual is circumambulation of the sacred fire. The Mochi are widely spread throughout most of South Asia. It will likely require much effort and expense to reach all of them with the Gospel message. 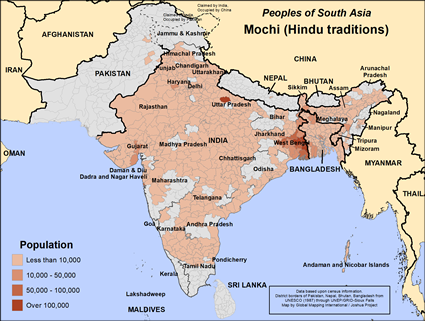 Perhaps the Mochi Christians in India will grow in numbers and spiritual maturity to the extent they can effectively take the good news of Jesus to all their own people, not only in India but in Bangladesh and Pakistan as well. Please pray for this to occur. 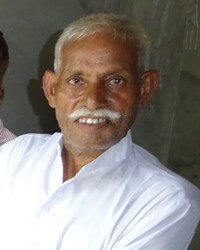 A number of people in the Mochi community have reported themselves as Christians to the census of India (the Mochi live in India and Pakistan as well as in Bangladesh). Please pray these Christians will learn to quickly confess sin as needed, and will learn to live in the power of the Lord's Spirit, being zealous to know and serve the Lord. Pray for this low status caste to be able to improve their lot in life, with rising educational levels. Pray especially for children to gain skills to make them employable. View Mochi (Hindu traditions) in all countries.